Poised at the top of an escarment, a man with a shaved head blows into a conch shell encouraging the other walkers that are climbing up to the top of the peak. They all wear a white or saffron colored outfit and they are all equipped with a walking stick. It is the first stop since the group has left the Zenki Monastery, about two hours ago. As far as the eye can see, the forest climbs in waves hugging close to the top of the mountain peak. In front of the procession, lie two large vertical rock columns that rise up to the sky. The columns are about two meters apart. At the base, the group recites Buddhist litany and ritual invocations to the spirits. They then climb, one after another, up the coulmn by using the narrow ridges for footholds and handholds. They make their way around the two towers. 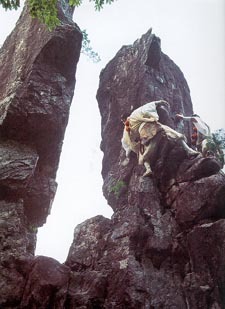 About halfway up, gripping the ridges on the rock, with back or front facing the outside, they lunge out from one rock pillar to the next and continue to climb. Later on, on the side of the mountain, in the heart of the forest, a series of pilgrims dot the narrow trails. We are in the heart of Mount Omine. A chain of mountains that crosses from north to south on the Kii Peninsula, located on the east coast of Japan, south of Osaka. These men in orange or white are Yamabushi, practitioners of Shugendo. Yamabushi roughly translated are "the one that sleeps in the mountain." The test of the "two stones" that they have accomplished is one of the many challenges that are interspersed along the trail. These test or challenges have been part and practice of these pilgrimages for centuries. The Yamabushi are to the orint what the knight templars are to the occidentals. The forest of Omine is for Japan what the forest of druids was to the Bretons. The regions filled with magic, myth and legends. Shugendo literally signifies the path(Do) of power(Gen) obtained by the practice of ascetism (Shu). This is the path of acquiring divine power through the virtuous practice of ascetism. This current religion is at the crossroads between Buddhism and Shintoism. Still very active in the 21st Century, it has been mentioned in books since the first books appeared in the 8th century. Since the beginning, the Japanese considered the Mountains as an area above theirs. It is a world where the profane are not allowed. The summits were therefore populated with formidable deities. The deities were despensers of chastisement to those that would transgress the sacred social rule and the life of others. As a consequence, Shugendo has adpted the power of these native spirits called 'Gods fo the Mountain' from the Buddhist esoteric schools of Shingon and Tendai. By following a series of rules, rituals ans esoteric practices, the Yamabushi is seeking, even nowadays, to connect with the divinities. In return, they acquire powers that they can use in society through various methods of divination, oracles and healing. In Japan, forests and mountains are indistinguishable. These areas occupy two thirds of the country. This is so evident that Shugendo is often referred to as the religion of the mountains, of the trees, rocks and nature in general. Each sacred site is dedicated to a specific deity. These natural areas are naturally protected by a wooded area, which represents the most ancient form of evidence of Japanese style of worship. There is usually found a tree or branch covered with a strip of sacred paper. On the paper are requests for divine influence to the given diety, wishing that favour will fall upon the individual during the moment of the ritual or ceremony. Since the 10th century, the peninsula of Kii, also called the 'Land of the Trees', has been the sacred grounds of Shugendo. The slopes of the average mountain vary between 1000 and 2000 meters in elevation. Deciduous and coniferous trees are combined in sub tropical vegetation. The undergrowth and forest are filled with wild animals, insects, wild plants and berries. The region of Kumano (Birth place of Aikido and other schools of martial arts) is located at the most southern point of the peninsula and has very luxurious vegetation. Oaks, pine and chestnut trees are mixed with wild cameilla. The camellias are known as the 'mountain lotus'. This area is also host to Rodhondrons, Camphiers and palm trees. These areas are not accessible by any vehicle and have managed to preserve their pristine natural splendor. They have become a natural treasure of flora and fauna. Since the 8th Century, the adept Shugendo practitioners gather together on the slopes of the Omine chain of mountains. These mountains have become the appointed fortress and the findamental training grounds. They have developed two distinct groups of temples and heritages. In the south, there are the 'three mountains of Kumano'. The centers are located in Hongu, Shingu and Nachi. Nachi is famous for its waterfall, the highest in Japan. In the North, there are centers an mount Yoshino cillage. It is from the North center that the pilgrimage takes place four times a year. These pilgrimages are also referred to as the rites of passage and initiation to access the mountain. In the summer, in the winter, during tropical rain storms or the cold Siberian winds, the Yamabushi would retreat into the hermitages, monastery, in caves and caverns where they would live in solitude. They would live off wild plants and berries. During the spring and fall, they would travel the 180 kilometer trek that links the village of Yoshino and take them to the port city of Kumano. These treks would be done in groups made up of several hundred walkers. The trek is dotted with secret rituals and 75 stations that are dedicated to the services of the Buddha and other divinities. The different Shugendo groups traveling on these mountain trails will take up all these 75 rites. Even if they were established on other mountains. During the course of centuries, while the Yamabushi were traveling from village to village, their teachings would be disseminated into Japanese society, especially in the well populated cities. During the Meiji era, in 1872, the imperial powers forbade and banned all superstitious and syncretic practices. They only started to openly practice again after 1945 with the restoration of Japanese Culture Act. The ascetic path on Mount Omine was therefore reopened again. At first the northern half, then in 1980, thw whole length of the mountain trail was opened up. It was in this context that I engaged in my study and practice of Shugendo. First starting off as a lay practitioner for 10 years. Since 1990, I have become a monk from the Shogoin-Monzeki temple located in Kyoto. This allowed me the opportunity to accomplish numerous solo and group excursions into the mountains of Mount Omine and also on Mount Sanjo. Mount Menjo has been the Mecca for Shugendo since 1789. Women are still forbidden to climb certain areas of Mount Omine. It is on this most sacred mountain that men submit themselves to strenuous climbs and arduous trails, that after one day of this, most people seriously question themselves as to why they are there. After being purified by the cooling waters of the river that runs at the base of the Mount Yoshino, the Yamabushi will go under a massive rock beam to reach natural temples and sanctuaries that rise up from the ground. The ascetic starts with 12 hours of walking, followed by trials at the end of the day in the two distinct zones of the summit of mount Sanjo, the internal and external areas. There are three exterior sites (Omote Gyoba) and eighteen interior sites (Ura Gyoba). The Yamabushi will have to climb the rock face called the 'hanging bell' (Kane-Kane-Iwa), and then recite the sacred text and invocations in front of the 'turtle stone' (Kame-Ishi). On the next trial the novice is suspended by their ankles and waists over a cliff. The life of the Novice is in the hands of those that are holding them up. During this fearsome trial called “the insight from the West” (Nishi No Nozoki), the novice is compelled to admit their faults and their wrong doings and promise to follow all the religious and secular principles and laws. This terrifying trial will repeat itself in one of the areas of the internal 18 sites. There is a site which is called “the insight from the East” (Higashi No Nozoki), which causes the greatest feeling of vertigo because the rocks that you lie are crumbling apart. In the past, some would have perished, due to the seriousness of their faults would have pulled them down into the abyss. The Yamabushi traverse then long and narrow rocky passages that are nicknamed “Passage through the uterus” (Tainai Kuguri). Then they come out of the ground through a hole in the ground aptly named the “Ant nest opening” (Ari Notô Watar). Followed by a passage that goes around a rock tower that overlooks a deep cliff. Where only several projections of the walls serve as points of support and allow the individual to cross over to the other side of the escarpment. This is place is called the “rock of equality” (Byodo Iwa). This stage finishes off with a sacred fire ritual called Saito Dai Goma. The Saito Dai Goma is performed in front of the Mount Sanjo temple. This is the place where Zao Gongen, (the guarding deity of Mount Sanjo), first appeared to En-No-Gyoja, the founder of Shugendo. This deity appeared to him during the 7th century while he was on retreat. The intense experiences that the Yamabushi have experienced during the course of the days constitute at the same time the means and the purpose of the practice. Only by putting their lives at risk do they get to purify themselves of all the blemishes that are inherent in the human condition. Through suffering of the body, similar to small deaths, the Yamabushi become conscious of their spiritual dimension. Grounding themselves with the Deities, the Buddha and the Universe. The Yamabushi claim that “ To hear and understand the Buddha’s sermon you have to listen to the whisper of the wind at the top of the mountain”. The next day, the group of men rejoin the women at a site called “return of the asetic” (Gyoja Gaéri). From there, they follow a foot trail that goes up the highest peaks in this chain of mountains that run from the peninsula and they traverse Mount Merou and Mount Sakkyamuni. The trail runs right into the hermit’s temple (Jinsen No Yado). This is the midway point to mount Ominé. When they reach the entrance to the three sanctuaries of Hongu, Shingu and Nachi, the will reach the healing hot springs of Yu No Miné. It is the oldest sulphur bath of Japan. It was discovered by the ascetic En-No-Gyoja who used it often to revitalize his body after very arduous ascetic practice. If the three sanctuaries of Kumano are the ultimate goal, then the hot spring is the perfect way to end this stage of the voyage. The circumnavigating route is an endless and exhausting hike lasting 12 hours a day and running over several days. The route is full of frequent stops for reciting mantras and performing secret rituals. The path is made up of trails that go up and down, and range in altitude between 800 to 2000 meters in elevation. The journey unfolds in a naturally beautiful scenery but only for those individuals that can rise to the challenge. The Yamabushi must forge ahead on narrow paths that overlook precipices and cliffs. There are sections of the path that are so steep where the use of a wooden ladder or chain is required. On another section of the trail, the Yamabushi must pass through a growth of dwarf bamboo. One must be very careful when clearing the path by hand because the bamboo leaves have sharp edges. Tree roots also pose a problem to weary travelers. The roots seem to come alive and try to trip up the passing pilgrims. Overhanging evergreen branches also add to the duress of the trail by whipping the person behind you in the face. There are also leeches that fall from the trees and land on the hot and sweaty Yamabushi. In the lush vegetation, the Yamabushi, in single file, walk to the cadence set by the rhythm of the song that they chant. Occasionally, conch shell calls are made and answered. The sound of this instrument is the voice of Buddha. The sound helps to encourage the walkers, extols the Gods and protects the walkers from the attack from wild animals and wards off any evils spirits. All along the marathon journey, the Yamabushi has to stave off fatigue, hunger and thirst. They must obey the orders of the guides and elders. Respect the rule of the group. And listen to the instructions that are dispensed along the 75 stations of dedication. For the Shugendo adept, these trials correspond to the what the soul endures during the course of residence in the “ten worlds and beyond (Jukkai Shugyo). By being submitted to them in advance, they find themselves exempt from death. But the ultimate goal is the fusion with the universe. To return to the time before the “Big Bang”. To return to the cosmic nucleus of the universal matrix (The color of the Yamabushi outfit is the same color of the amniotic fluid). 'It is only after having completed the course on Ominé do we understand the meaning of these practices' the old Yamabushi extols this advice to the novices who are attempting to reach the summit for the first time. For the participants, the journey into the mountains can assume a multitude of significance. It can be a search for healing or new “powers”. It can be a quest of the heart for some. It can be the fulfillment of a long time whish to complete the course. It can also symbolize the return towards the original matrix, where the Yamabushi are revived. Emerging from the vast mountains, they are reborn in a purified state and are already walking towards a new destiny. I would like to warn the reader in regards to a precise point: In English, it is usual to call a Buddhist school "sect." but this term has degenerated to take a on a pathological connotation referencing the new religious movements which, under cover of ancestral traditions, make money, deprive individuals of their freedom and are thus contrary to the Buddhist doctrines. In French the word "sect" sounds very bad, just as the word "doctrines" which seems synonymous with ‘wearing blinders’ or being willing deceived. Shugendo is not a sect with the pejorative direction! It is an extremely old tradition whose practice requires : Fluency with the Japanese language, capacity to remain in Japan at the temple for a long time to study and practise, and the ability pass the tests necessary to be able to go more deeply into the study. Like the Knights of Europe in the search for the Grail, Shugendo is more a Spiritual Order that a religious movement even if its statute in Japan is that of a Buddhist school. Shugendô is much more than Buddhism. In addition, ancestral shugendô never tries to proselytize ! It does not seek to grow in a number, only to perpetuate a thousand-year-old tradition. This is the tradition of the Shogoin Temple, which is one of the oldest in Kyoto. Considerable new "sects" of Japan, with individuals dressed like Yamabushi, sow confusion in the mind of those who do not know and understand true Shugendô and who hasten to seize onto this bad image. I had to study all the schools of Shugendô to know all the different doctrines which characterize them. Considerable numbers of ancestral Japanese schools of esoteric Buddhism (mikkyo) are not the paragons of virtue they are sometimes thought to be, in particular in Shingon or Zen. It is an absolute disaster for he who would try to follow this labyrinth of the new “sects”, the bad schools and the schools with mercantile goals. It took me twenty years to finally find this rare jewel that is a sincere and true schools, with genuine traditions and individuals. But great thoughtfulness is required to become a member of it, not as simple as filling in a form. It is necessary to make strong efforts like learning Japanese and passing the examinations of entry and exit of the temples. To be a Yamabushi is not simple; it should be deserved! The Shugendo of the old temples Shogoin Monzeki, Kimpusenji, Tonan-in, Sambôin-Daigoji, Chikurin-in, Sakuramotobô, Kizoin, Ryusenji and Haguro Shozenin, Seigandoji is worthy of confidence, interest and does not have to be compared to an "unhealthy sect". I am saying this against such sects which sometimes use in their ceremonies the behaviour of Yamabushi; or some new shugendo groups who are making "pseudo-monk-shugenja" in only few days (mika-syugenjya). Some of this new religions are saying big historical & doctrinal liars, using wrong words against traditional priesthood, as "Old school shugen" which is new shugen sect bornt around 21 century. It's making confusion inside neophyt mind... Mistrust and vigilance! I practiced more than ten years to be accepted by the Shogoin Temple of Honzan Shugen Tradition! This is guide! If one says yes to you too quickly, be wary, perhaps it is the trap of a sect!